This past weekend I got to participate as a Red Rider at Tour de Cure. Red Riders are diabetics (any type) who ride with diabetes. 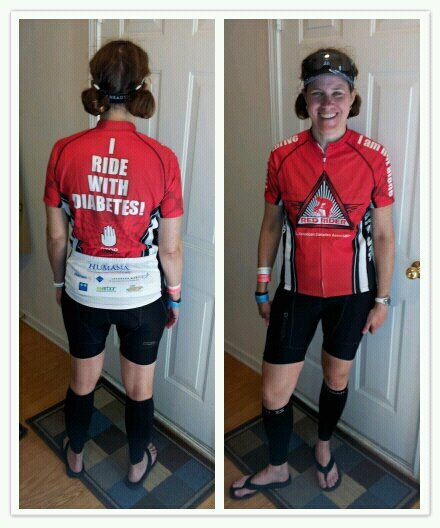 As you can see we wear jerseys designating ourselves as red riders and it's encouraging to hear the well wishes as you ride by! I joined the 66 miler group and was encouraged to see just how many red riders were part of this group. We got to lead the group out and there were quite a few fast red riders who I got to do the first 20ish miles with. Unfortunately I wasn't at all feeling my best this past weekend so I had to back off the pace but I really enjoy being around others who know what it's like to have this extra 'special' element of training and racing to contend with. After the ride I went to the Red Rider tent to have lunch with the group. During lunch I pulled out my continuous glucose monitor (CGM) to check my blood glucose and was really surprised that a couple of people questioned me on what it was. Though most of the group I was sitting with were type 1 diabetics they were not familiar with a CGM because their insurance won't cover it. Perhaps I am naive but I was shocked that this was the case. My CGM is key in managing my diabetes and I can't imagine being without it. One guy told me he had been on a CGM but when he switched jobs he got insurance that no longer covered it and his health had suffered for it. There were also several stories where others had been forced off of their current insulin or blood glucose meter strips for a brand that their insurance carrier preferred. Unbelievable - these changes have a very direct and measurable impact on the health of a diabetic. I am SO thankful for the excellent coverage I get with my employer - I do pay up to get the highest coverage level and I pay a LOT out of pocket every year to stay with the brands I prefer. I do not let my carrier sway me when they get a new deal with a different insulin or strips provider. I never realized just how lucky I was to have the coverage I do and to be able to afford to go out of pocket when needed. I obviously have a lot to be thankful for but it does make me pause to realize others aren't getting the same advantages. I can't ever stop marveling at what you do and the wonderful person that you are. God luck in all you do. It is sad that this happens everyday! thanks for sharing your experience Susan. Good luck with the continued training!